Shirley Jean Sargent, 77, of Double Springs entered into rest on Sunday, April 14, 2019 at Princeton Hospital surrounded by her loving family. 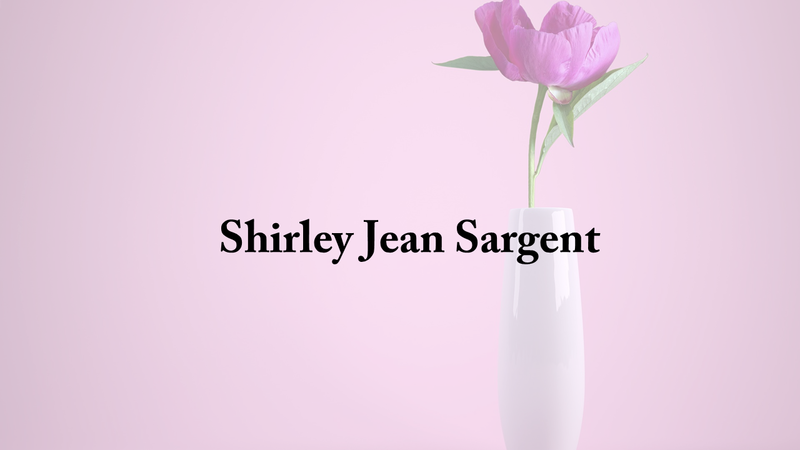 Ms. Sargent was born on June 6, 1941 in Double Springs, Alabama. Shirley was a member of the Double Springs Church of Christ for 30 years. Shirley graduated June 1, 1959 from Warner Robins High School in Warner Robins, Georgia. She married George H. Sargent on Oct. 6, 1959. The two of them began their family, worked, traveled and relocated to many Georgia State Park locations as park superintendents for the State of Georgia. She retired from the Town of Double Springs Water and Sewer Department in 2006. Shirley loved cooking, Auburn Football, shopping, the beach, reading, going to church, and especially inviting people to go with her to church. She spent her last months on earth taking care of her great-granddaughter, which thrilled her. Above all she enjoyed serving God, spending time with her children, grandchildren and great-grandchildren. Visitation will be on Tuesday, April 16, 2019 from 6-9 p.m. at the Double Springs Church of Christ. Mrs. Sargent will lie in state from noon-1 p.m. on Wednesday at the church, where the service will follow at 1 p.m. Vance Hutton and Justin Guin will officiate. Burial will follow at Fairview Cemetery in Double Springs. Shirley is survived by her daughter, Kim Sargent; son, Richard Sargent and his girlfriend Tina Melson; daughter, Kristi Bonds and her husband Casey; sister, Regina Holland (Kevin). She was “Nana” to Alexis Willis (Chop), Jenna Stephens, Charles Willis (Jamie), William Sargent (Jessica), Jewel Melson, Cameron Costin (Cory) Kady Bonds, Brooks Bonds, Jordan Gibson (Greg), Ally Baus (Paul) and 9 great grandchildren. Best friend for over 70 years, Joyce Wyatt and a host of nieces and nephews. She was preceded in death by her husband, George H. Sargent; mother, Lorene Goddard; father, Otis Goddard; sister Debbie Duncan.